The plantar fascia is a flat band of tissue spanning from your heel to your toes, naturally supporting your arch. Lack of support and repetitive stress and strain on the tissue causes painful inflammation called plantar fasciitis. Custom moldable orthotic insoles are designed to improve alignment and provide the support you need to reduce pain and prevent further injury. Pain is usually felt near your heel and is worse in the morning after it has had a chance to shorten overnight. Walking and running usually help to warm up the tissue so symptoms don’t usually occur when you’re active. Plantar fasciitis, and the pain associated with it, can be caused by a biomechanical issue, improper running shoes, use of high heels, increasing activity levels or from tight or weak calf muscles. 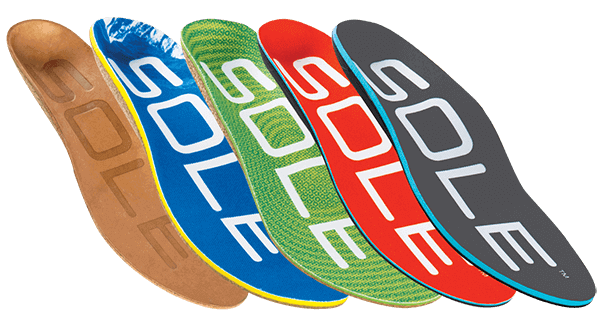 The orthopedic shape and personalized mold of SOLE’s footbeds allow your feet to rest in an ideal neutral position, reducing arch strain and alleviating plantar fascia strain by 34%. I developed a nasty case of Plantar Fasciitis. I was hobbling around until a friend recommended SOLE footbeds to me. I found a store nearby and was walking pain-free in a few days and running in a couple of weeks. I have a pair for every shoe. I tried custom made insoles and they were clumsy and painful. SOLE insoles felt natural and got me running again. I have been a runner since high school and, as my body aged, my feet hurt constantly with plantar fasciitis. Put SOLE footbeds in my shoes and now I can run six miles daily with no pain. Not bad for 42 years old! Thank you SOLE for taking the pain away so I can enjoy my daily runs again.